Seeking a relaxing holiday in the sun? Where you can move at your own pace, when you wish? Then experience the marvellous scenic solitude, and the peaceful relaxation of a bareboat sailing holiday in one of New Zealand's most beautiful sailing destinations - the Hauraki Gulf Maritime Park Region. Auckland's Hauraki Gulf Maritime Park is home to 65 unspoilt islands amid 1500 miles of sheltered crystal blue waters, letting you unwind whilst discovering your own secluded cove, white sandy beaches, and native bush walks. There are so many options to choose from in the Hauraki Gulf for sheltered overnight anchoring, allowing you to "get away from it all" and relax. Natural beauty and marvellously sheltered coves, harbours and beaches of Kawau Island, with historic "Mansion House" former residence of Sir George Grey, Governor General of New Zealand over 1865 - 1870. World reknowned bird sanctuary and reserve on Tiri Tiri Matangi Island, offering wonderful scenic walking opportunities. Ambience and atmosphere, arts and crafts, cafes, restaurants and vineyards with the stunning white sandy beachs of Waiheke Island. Fiordlike anchorages and the stunning natural beauty and solitude of Great Barrier Island, home to Port Fitzroy's many scenic wonders. Easy access to seven different marina complexes spread throughout the Hauraki Gulf , should you wish to explore other parts of the Auckland Region or beyond. Tui Yacht Charters is a family owned company that knows the Hauraki Gulf and its many islands, bays and many sheltered harbours. Our cruising area comprises some 65 islands and 1500 square miles of beautiful waters. Our Vessel "Rubaiyat" is a 31 foot Alan Wright designed sailing sloop offering comfortable accomodation for four-five adults. Rubaiyat has all conveniences on board, including pressurised hot & cold water, internal and deck hot showers, stereo, a fully equiped galley including oven, fridge and freezer. For your cruising safety, in addition to the installations required by our license our equipment includes VHF Radio and GPS to easily determine your position at any time. Rubaiyat is offered for bareboat charter for periods of 4-days minimum; extended cruising of 2-3 weeks can be arranged at very realistic terms, depending upon the sailing season. 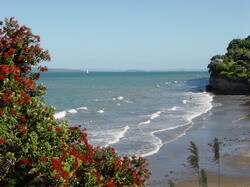 The Hauraki Gulf's weather is at its best over the months of December through to April; however excellent sailing is possible during our spring months of September to November. 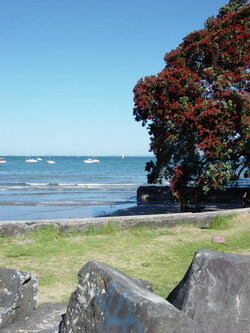 So come and enjoy New Zealand's beautiful Hauraki Gulf Maritime Park on a cruise aboard Rubaiyat.